With the early coming of summer, Sacramentans are going to be jumping into their home pools early this year. While having a home pool is fun and refreshing, and certainly one of the great joys of living in a Californian climate, it also is a time to start thinking about protecting our loved ones. It is an unfortunate fact, but each year thousands of children lose their lives due to accidental drownings with a good number of those thousands of deaths occurring in the family pool. To make matters worse, it is a little known fact that many more thousands of pets drown each year by falling into unprotected pools, spas, and other water-hazards such as backyard ponds and watering holes. According to PET MD, “Consider the drowning deaths of 4,000 children every year in swimming pools across the US. Multiply by one hundred and you have a reasonable guess at the number of dogs that drown each year in our backyard watering holes.” That’s a huge number, but unfortunately, it is not something that many of us as pet owners take into account or consider until it is too late. Gary Siewert, owner of S&S Fence Company, agrees. It is estimated that there are more than 1.1 million swimming pools in California and counting. Therefore, the potential hazard to family pets is obvious. And although hard statistics are hard to come by, a casual survey of friends and family often leads to more than a few horror stories. The statistics for child drownings, however, are well documented: Drowning is the #1 cause of death for children under the age of 5 in California. Even more shocking is the fact that a high percentage of poo;-elated drownings occurred while under the supervision of a parent or other responsible adult. This is a circumstance to which Siewert can relate to personally. For more information contact Gary Siewert at (916) 682-1100 or email him at gary@fencing-contractors.com. Sacramento inventor and businessman Gary Siewert is in the process of bringing international attention to his revolutionary new sports device as a key supplier to the 2015 Pan Am Games. Siewert, who is co-owner of S&S Fence Company, is the creator of the SportaFence, a patent-pending new type of outfield fence that has been accruing enormous popularity throughout the United States since its debut on the national stage a few years ago. The SportaFence has the ability to quickly and efficiently turn single-use sporting faculties into multi-use athletic facilities without having to compromise on issues of safety or functionality. Unlike temporary vinyl outfield fences which are unsightly and can fracture and break on collision, the SportaFence, once securely in place, has the exact look and feel of a standard baseball or softball outfield fence. History will be made at the President’s Choice Ajax Pan Am Ballpark in the summer of 2015 when it hosts all baseball and softball games, including women’s baseball — a first in a multi-sport Games — as well as the return of men’s softball to the Pan Am sport program. Two current soccer fields will be converted into a Games-time baseball diamond and an adjacent diamond will be rebuilt with new sod and clay to meet the most up-to-date International Baseball Federation (IBAF) standards. The fact that the SportaFence will not damage synthetic or artificial turf athletic fields makes it almost a “must have” item for sports facility architects and builders. And as the word spreads around the nation’s recreation and parks directors and city officials, the orders for the SportaFence have poured in–the most prominent of which has been to the national Amateur Softball Association sports complex headquartered in Oklahoma City, Oklahoma. There the SportaFence made its national debut on ESPN during a woman’s collegiate softball tournament. The SportaFence demonstrated another extremely important design feature that was purposely built into the system and was recently the subject of a White House summit: Increased sports safety and a decrease in danger from head injures and concussions. Sports careers have been ended and severe sports injuries have been sustained due to violent collisions with the outfield fence. Unlike traditional outfield fences — which are fixed permanently into place with heavy steel post — and the SportaFence acts like a giant shock absorber and greatly reduces the chances of severe injury due to collision. This increased safety factor was clearly evident during the course of the ESPN telecast when female collegiate softball players made contact with the SportaFence making plays on softballs hit deep into the outfield without injury. As time goes on, this feature of the sports device may become an attractive way of lowering legal liabilities for sports entities. The 2015 Pan American Games is a major international multi-sport event that is scheduled to be held from July 10–26, 2015, in Toronto, Ontario, Canada. They are held every four years in the year just prior to the Olympic Games, which in 2016 will be held in Rio de Janeiro Brazil. Some 6,000 athletes from 41 nations are expected to participate in 36 sports. The baseball/softball competition will be in Ajax — a town in the Durham Region of Southern Ontario, Canada, located approximately 16 miles east of Toronto on the shores of Lake Ontario. 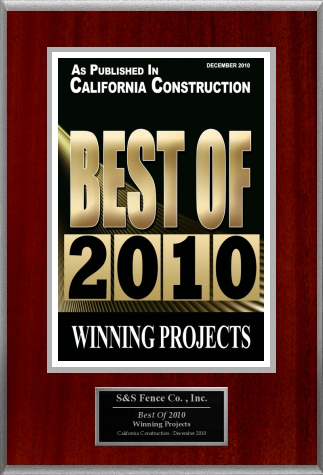 Sacramento’s S&S Fence Company has been recognized as a California Construction Magazine Best of 2010 Winner. The McGraw-Hill Construction publication annually honors the state’s top construction projects. An independent jury of industry experts in design and construction judged more than 135 nominated projects in a variety of categories. S&S Fence Company won for the fence installation in the reconfiguration of the California State University, East Bay’s football stadium field in Hayward, California. The California State University — which no longer has a football program–converted the football stadium into a top-notch NCAA-level soccer facility. The renovated sports facility is also the new home field of the FC Gold Pride, a women’s professional soccer team. S&S Fence has a long history of working with California’s universities and on State projects. Past fence installation projects include sports facilities for Sacramento State University, large scale animal-safe enclosures for the University of California, Davis, and fencing projects for Caltrans just to name a few. Additionally, S&S Fence is the official fence contractor for the City of Sacramento–on call to handle any fencing needs that the city might have at a moments notice. Although the end result was an aesthetic sports facility that was pleasing to the eye, the project was not without difficulty. Extreme wet conditions during the height of a very wet rainy season caused delays. The hilly terrain created its own challenges for fence installation, and a high level of coordination and teamwork was necessary to bring the project in on time and under budget. S&S Fence has built and installed fences from one end of the state of California to the other. A Service-Disabled Veteran-owned company (Stephen Siewert is a Vietnam-era veteran who was injured during the war), has and can install virtually every type of fence and fencing needs–including custom made and hard -to-find specialty fencing. The company also builds and installs arbors, bollards, automatic gate systems, and handrails. A lifelong sportsman and athlete, Gary Siewert is also the creator of the SportaFence, a patent pending new concept in outfield fences for baseball and softball (an example of the device can be seen at http://www.outfieldfencebaseballsoftball.com). The revolutionary new device is already in production and has been installed on several baseball and softball diamonds across the U.S.